The M2D2 Challenge has grown immensely over the last 8 years. With that growth we’ve seen a large increase in applicants—and questions! During this informational webinar, MPR‘s Director of Business Development Jeff Champagne, and M2D2’s own Director of Operations Mary Ann Picard, take the time to answer some of your most pressing questions about the global competition. Over the 20-minute presentation, Mary Ann and Jeff will also offer their application advice and pitch tips to help your chances of securing a slot as a finalist. Watch the webinar archive now! Still have questions? 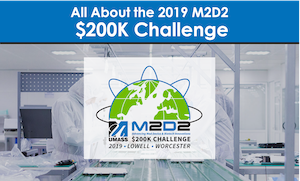 Head over to uml.edu/Research/M2D2/200K-challenge for more information, or you can reach out to m2d2@uml.edu. Entries for the 2019 Challenge are Due 2/18/19.